From the moment you arrive to collect your campervan from Wilderness Motorhomes we have the kids taken care of. 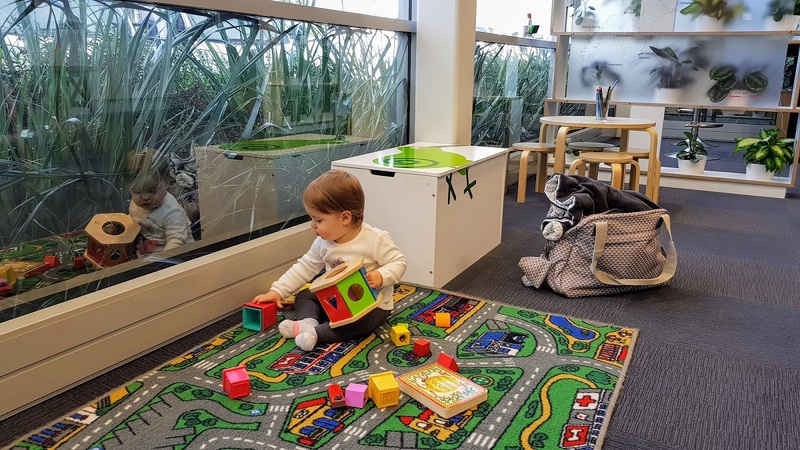 Both our Auckland and Christchurch bases have toys and a play area in our pick-up zones so the little ones are occupied while we check you in. All our motorhomes have televisions and DVD players and the stereos in the drivers’ cab have Bluetooth and USB ports if you want to connect your phone to play music or stories. Our onboard WiFi can be a huge help in keeping kids entertained at night (or if you need to download more books to your Kindle) and you can turn it on and off easily as required to limit screen time. It works up to about 20m from the campervan too. We also have bikes for hire, with sizes suitable for children and adults. New Zealand is full of great cycle tracks, from easy scenic rides to more challenging mountain bike trails. Your bike hire includes a bike rack, lock, pump and repair kit. There are also children’s seats suitable for up to 20kg (approx. 3 years old). You can find out more about what’s available on our Accessories page here. 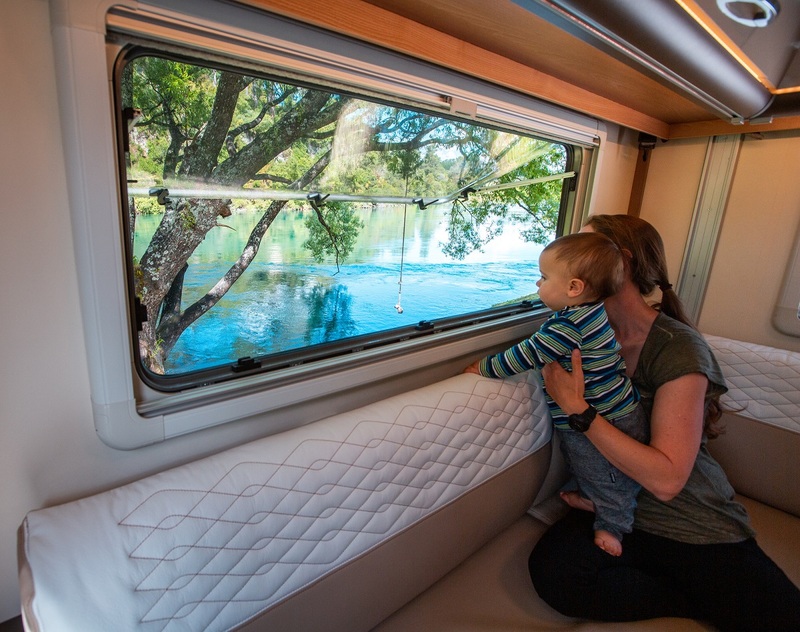 A good night’s sleep is key to a successful family holiday and there is a range of sleeping options in Wilderness campervans, from single to double beds, depending on the age of your children. Most motorhomes have limited floor space so a standard travel cot won't work. 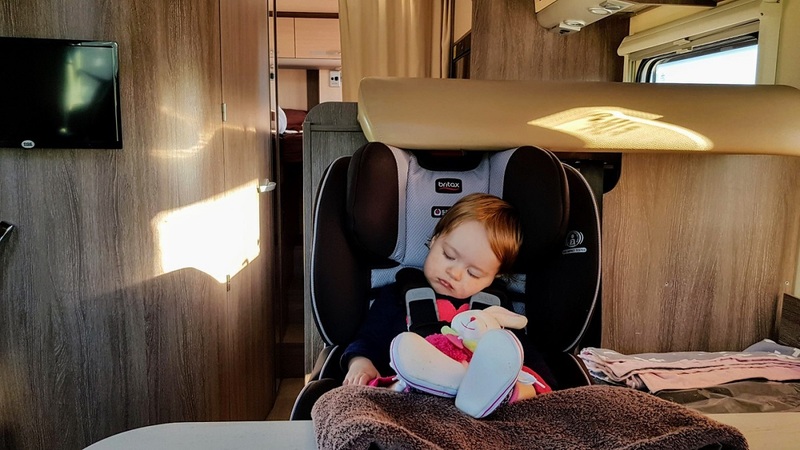 We have two options for hire: the Bubble cot will fit easily in any of our motorhomes, while the Nuna cot is slightly larger, doubles as a playpen and fits perfectly in the rear lounge of the Glider 4. Our reservations team will be able to help you with any questions you have about fitting a travel cot in your preferred motorhome model. Several of our motorhomes offer twin singles (that can convert to a large double) plus a double bed for Mum and Dad. Or, if you’re travelling with a couple of younger children, they could each sleep in a double bed with Mum or Dad. 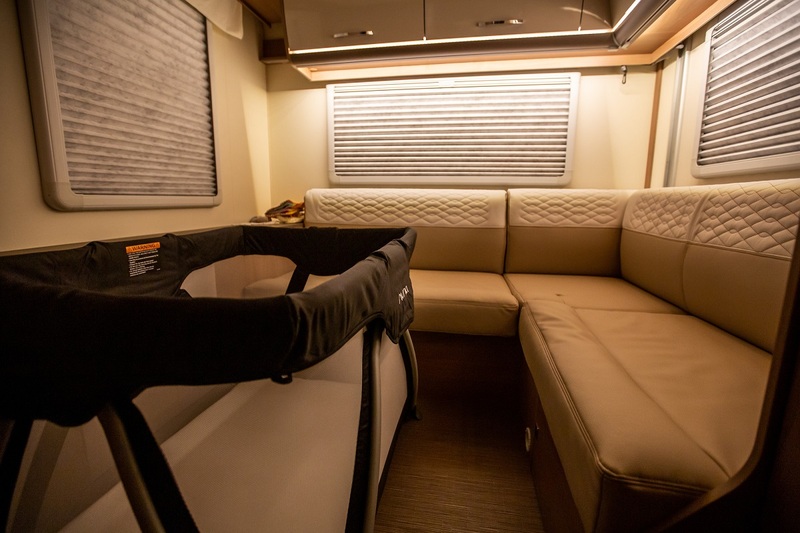 The Glider 4 is particularly good for travelling with children as it has an L-shaped lounge that can fit a port-a-cot, even when the two drop-down double beds are down at night-time (effectively sleeping five people). Then during the day, when both double beds are retracted into the ceiling, you have a lounge area and the dining area at the front. Use the handy ‘Compare Tool’ on the Wilderness Motorhomes website to see which configuration will best suit your family. No matter what time of year you’re travelling, our German designed and manufactured motorhomes are designed to keep you warm and cosy in winter with plenty of heating, or cool and comfortable in summer thanks to latchable windows and insect screens. Our Bürstner motorhomes also have night lights, which are handy when travelling with smaller children. These small LED lights near the floor guide you to the toilet at night without having to turn on the main lights and waking others. If you’re travelling with a toddler, we have portable high chairs that can be used on the floor of the campervan or strapped to a chair if you’re eating out. However, most New Zealand cafés and restaurants will have high chairs available for younger customers. Our motorhomes have a good amount of storage in the bathrooms (handy if you need to store nappies) and if you’re planning to bathe a baby then a small tub or bucket will fit in the shower base. The bathrooms also have heat vents and a hanger, so in colder weather you can simply turn the heat on and close the door to dry items overnight. Under New Zealand law, all children aged 0-7 years are required to travel in an age-appropriate car seat. 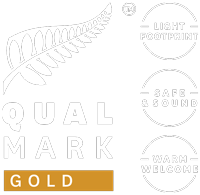 If you’re visiting New Zealand from overseas, then you can hire car seats for your children from Wilderness Motorhomes. The seats available all conform to New Zealand safety standards and are easy to fix onto seats in the dining zone when travelling. Our reservations team can help you work out which seats you’ll need. New Zealand is a relatively small country but some distances can take longer to travel than you expect as it is very hilly in places and some roads have many twists and turns. An app like Google Maps can be handy when calculating distance and driving times. It’s always good to plan regular breaks when travelling with children and in a motorhome you can simply park up, pop the kettle on and everyone can use the bathroom and stretch their legs. 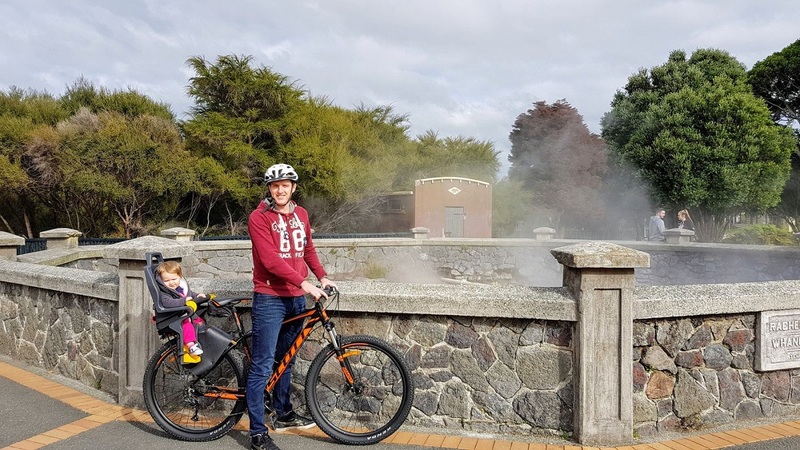 Handily, nearly every New Zealand town, no matter how small, will have a park with a playground near the centre that you can stop at to let the kids blow off steam. Our friendly reservations team at Wilderness Motorhomes is happy to answer any questions you might have about our campervans and their features. You can give us a call, send us an email or live chat on this website.